Here is the most awaiting Project Plan Template Excel 2013. 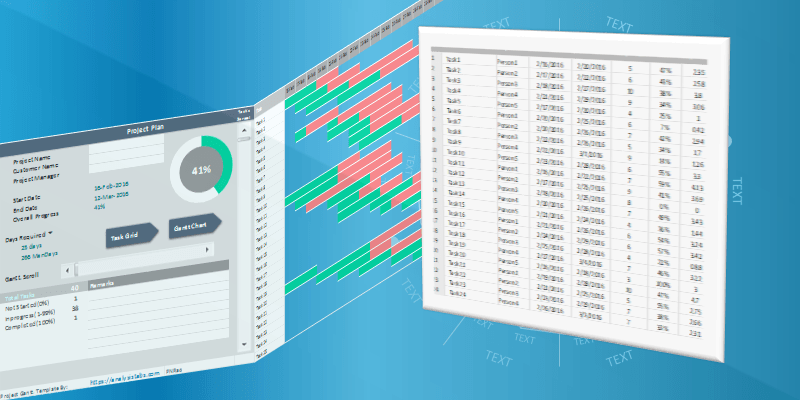 Now you can effectively plan your tasks using this Free Project Tracking Excel 2013 Template. We have created this template using Microsoft Excel 2013, and it works in Excel 2013 and Above. There are many Built-in Project Planner Templates Excel 2013 format in MS Office suite. This easy to use Gantt Project Planner Template in Excel 2013 format will help you clearly plan your tasks. Now you can streamline your project activities by downloading our Free Project Plan Template for Excel 2013. And below is the complete information about the template and download link of Free Project Tracking Excel Template. We have created this template using Excel 2013 (Microsoft Office suite). And you can download and open it in Excel 2007 and above. We have added few more features in our 2013 Excel Template. This is one of most useful Project Management Templates. Here are the new features added in the Project Plan 2013 version. Total Task is added in the Left section of the Template to indicate the total number of tasks in the Data Sheet. Below are the details about each spreadsheet in the Project Plan Template Excel 2013. Each Excel tab is created for different purpose. Details: This is the first worksheet in the Template. 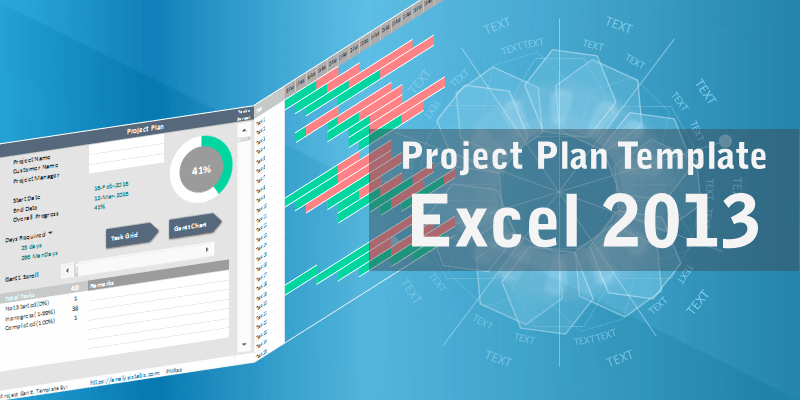 We have added brief introduction of Excel 2013 Project Plan Template. Also provided quick links to Navigate the other Sheets in the Template. And some of these links direct to Premium Project Plan Excel Templates. Project Plan: This is the actual 2013 Excel Template. 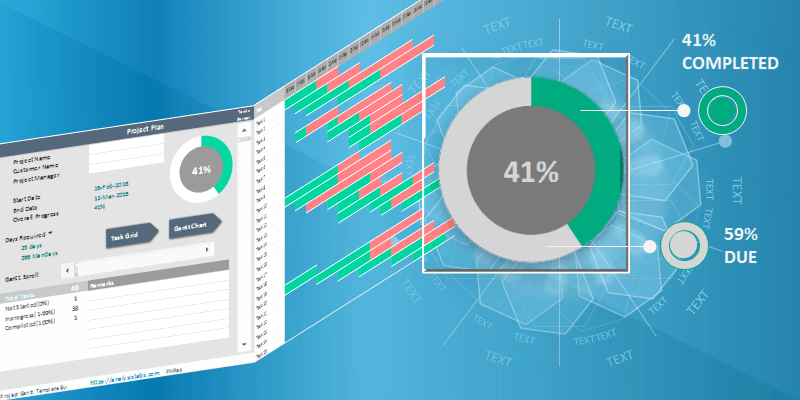 The left side section of the template contains controls and free cells to capture the Project details. And the right section of the template has the Task Grid and Gantt Chart with Task Status with Conditional Formatting. Data Sheet: Now we have separated the project tasks from main template. You can plan all your tasks in this sheet. And this will automatically reflect in the Main Sheet. Advanced Project Plan Template: This is the additional sheet to our Premium Project Management Templates. You can use the Free Excel 2013 Template, you can update to our Premium Project Management Templates. This will have more advanced options to effectively plan your Projects, Resources, Teams and Activities. Here are the simple steps to use our Project Plan Template Excel 2013. You can click the file link and save the file into your local folder, then open the file. Project Management 2013 Excel Planning Template contains two main sections. Summary Section: Left section of the ‘Project Plan’ Worksheet is to capture the Project details and it shows the Overall Progress of the Project. Task Grid Button Control: You can see the Task Grid Control in the left section of the Template. This helps you to toggle the Task Grid. You can hide and show the Task Grid by clicking on this button. 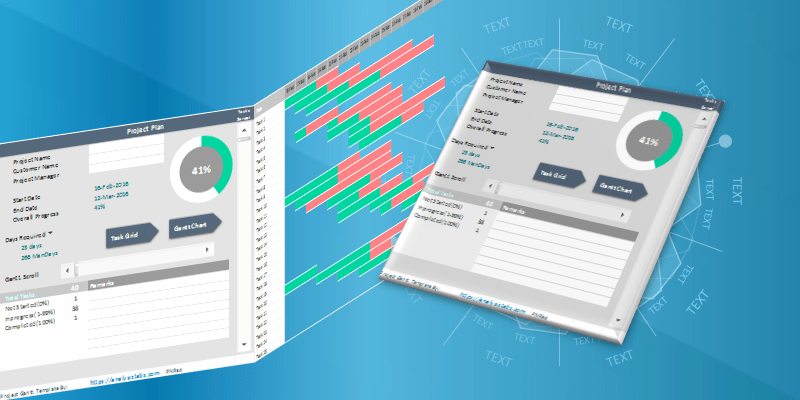 Gantt Chart Button Control: You can see the Gantt Chart Control in the left section of the Template. This helps you to toggle the Gantt Chart. You can hide and show the Gantt Chart by clicking on this button. Gantt Scroll Scrollbar Control: Gantt Scrollbar in the left section of the template helps you to scroll the timeliness of the Gantt Chart. This helps you to horizontally scroll the Gantt Chart information. Task Scroll Scrollbar Control: Task Scrollbar in the left section of the template helps you to scroll the tasks in the Gantt Chart. This helps you to vertically scroll the Gantt Chart information. Plans Section: And the right section of the template contains Task Grid and Gantt Chart. Task Grid contains the table format of the tasks which you have entered in the data sheet. And the Gantt Chart will be automatically populated based on this information. Task: Task is your activity name. You can enter your task or to-do activity label here. Responsible: Responsible person to complete this task. You can assign to your team member who is responsible to this task. Start Date: Date of the Task Starting day. You can enter the date according to the availability of the inputs and project or task deadlines. Days Req. : Number of days required to complete the task. You can enter a number based on the due date of the tasks. Progress: % Progress is the % of the work completed. This will be 0 (zero) when a project starts. And this will be 100% when the task is completed. We have made this Project Plan Template Excel 2013 as simple as possible. We have managed with just five important fields. You can add more fields if required. This 2013 version of Excel Project Plan Template is compatible with Windows and Mac. We have not used any Userforms Controls to work in both Operating Systems. 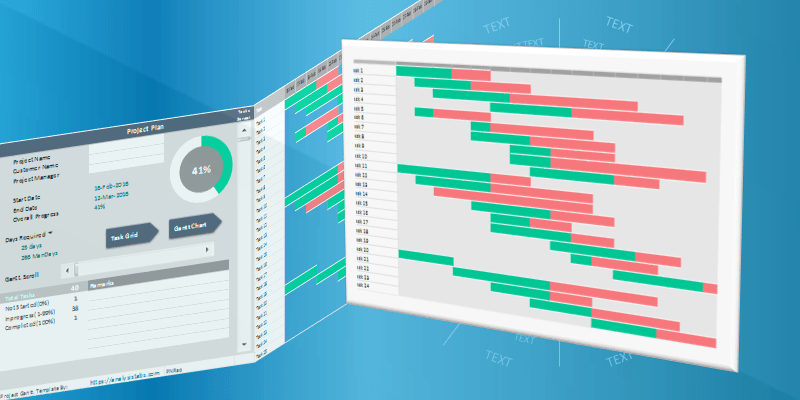 Gantt chart helps you to visually show your tasks in Gantt chart Format. You can use the Gantt Scrollbar to scroll the charts towards left and right. You can see 15 points at a time in the simple plan. Check our Advanced Project Plan template for more features. Task Gird of the Project Plan Template helps you to see all the information of you plans. You can see 25 tasks at a time in the Task Grid. You can use the Task Scrollbar to move up and down in the Task Grid. Overall Project Status is indicated using Pie Chart. We have highlighted the % Completion with Green Color and Work remaining with White Color. It is the BEST! Amazing Excel 2013 Project Planning template. Very powerful and easy to create plans. Wow! Really powerful and easy to customize. Thanks a lot for this free excel project plan 2013 template.